Many in Lowell recall the vast granite and brick buildings at Thorndike’s intersection with Highland as the Keith Academy building. 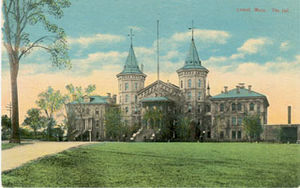 Before Keith Academy, though, the buildings housed the Lowell Jail. The Lowell Jail was the city’s second, replacing the first which had been located at the corner of Dutton and Cushing streets, and dated from 1838. In the years leading up to the Civil War, the new jail was designed and built. Ninety cells were constructed for men, and 12 for women who were housed in the building’s northern wing. The jail boasted two hospitals as well as four cells for solitary confinement. A chapel was added a few decades later, around 1900. One hundred years ago, in 1912, the Lowell jail housed some 124 inmates. Most were men who were serving short-term sentences of less than three years. 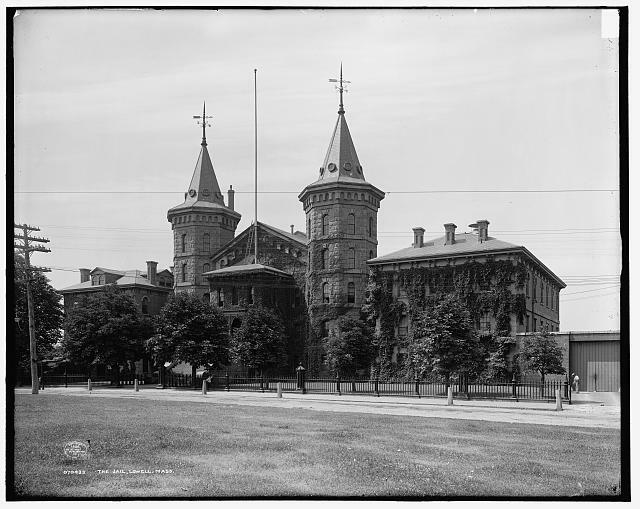 Men who were convicted of more serious crimes were kept at the Cambridge Jail. Entering the prison, new inmates were showered, given a prison uniform and underwear. Some inmates worked in the kitchen. Some worked in the boiler or engine rooms or as launderers. Others, those deemed most trustworthy, worked in the barns, gardens, or with the chickens. These inmates with greater liberties were known as “trusties”. It was important to prison officials that inmates were kept reasonably busy, and that they weren’t allowed to be too idle or too overworked. Each morning, the men showered with the soap and towel given to them by the jail. Showers were followed by breakfast. At breakfast, each inmate received a cup and plate when they passed by an opening that connected the line of inmates to the kitchen. Through that opening, they received their food, however much they wanted, and took it back to their cells to eat their breakfasts. The food, while wholesome was not fancy at all and was cooked “under the most sanitary procedures”. The men were served desserts once weekly on Sundays. Each evening, the men received enough tobacco for a smoke after supper. All smoking ceased when lights went out at 8 o’clock. Women prisoners, though few, experienced a similar life. They spent their days doing laundry, sweeping, and doing general housework throughout the jail. Women were kept separate from men. All inmates were kept on one of the jail’s three floors. Men, who had earned the trust of prison officials, were allowed to share their cells with roommates. The lowest floors of the jail housed the storerooms, kitchen, and laundry. The Lowell Jail housed just two cells that were used for solitary confinement. The most frequently used cell was used only a couple of times a year. Most often, the cell was used for men who arrived to the prison and refused to acknowledge and accept the rules of the jail. The solitary confinement jail cell contained a bed, which was basically a hard board, and a blanket. The cell contained no window, and for ventilation, had a few small holes punched through the iron door. And that was the ‘nice’ solitary confinement cell. The other, never used, was in the facility’s basement, and described as a dungeon. Padded cell were available to hold those who were suffering from ‘wild delusions’. The need for this cell was quite frequent, apparently. The padding, in long strips, stretched from floor to ceiling. On each Sunday, Rev. N. W. Matthews, the jail chaplain, held a service in the chapel. Inmates were obligated to attend. The jail also had a library, which had about 500 books, in the areas of fiction, history, and travel. All of the jail’s vegetables were grown in its garden, and tended by the inmates. The vegetables were stored in the jail’s vegetable cellar. Hothouses were also on the jail’s grounds. Some inmates at the jail were vagrants too poor to afford their own housing during the cold winter months. Knowing well the sentences for a long list of crimes, they plotted carefully to receive a sentence long enough to protect them from the winter. Upon release, prisoners were given a suit of clothes and shoes, if they were too poor to afford their own. Some returned, occasionally, looking for a night’s shelter. The building remained a jail until 1919, when it was closed due to concerns related to rising fuel costs, as well as a lower incarceration rate brought on by the increase in men being recruited into the military to support US involvement in WWI. When the jail closed, its nine remaining inmates were moved to the jail in Cambridge. The building remained closed and unsold for seven years before it was purchased by the Catholic Church and converted into a boy’s preparatory school. The remodeling did little to change the exterior, but completely gutted and remodeled the interior. Keith Academy remained in the building until 1970. Today, the building that formerly housed the Lowell Jail and Keith Academy had been divided into 56 condominium units and still stands on Lowell’s Thorndike Street. After my uncle, Ralph Regis Giles, died in Korea, a stained glass window was installed and dedicated to him in Keith Academy. Do you know what happened to the window? Is it still there in the condominium complex?